Whatever name you pick for your baby is going to be lugged around by them for the rest of their life. It will be the first thing people judge them on, forever. In terms of life-long choices that are nigh-on impossible to change, they don’t come much bigger than this. So, yeah. Pressure’s on. And, while pre-pregnancy it seemed you could pluck names out of thin air that you just loved, once you’re growing a little no-name inside you – all bets are off. Suddenly, anything traditional is boring, anything trendy is a fad. Once innocuous names now rhyme with rude words that cruel imaginary kids will use as taunts. And of course, absolutely nothing sounds ‘right’ with your surname. 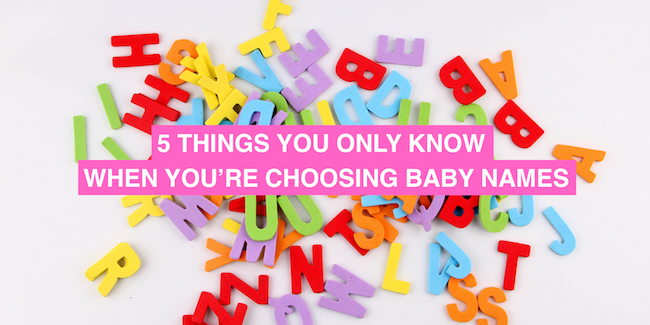 Yes, you’ve entered the strange world of name-choosing; here are my top five things to help you realise, you’re not alone. I love having an unusual name. Being just that little bit different from my classmates was a great gift, growing up. A gift I wanted to give my child, also. Turns out, it’s really hard. Each ‘unique’ name I came across suddenly sounded bizarre. Or, I worried that I only liked names because they were ‘a bit different’, not because they actually sounded nice. But, after many discussions, debates and list redrafts, my boyfriend and I picked two gorgeous names that would be just right for our beautiful boy or girl. Each one trod the delicate balance between ‘too common’ and ‘too weird’, was perfectly suited to the strong, special personality our baby would no-doubt have, and – most importantly – would give them just a little bit of an edge as we set them off on the sea of life. Oh and top tip: if you can avoid parks, fields, woods – basically anywhere that dog-walkers frequent – during your entire pregnancy, please do. There’s nothing like hearing someone call out ‘MILO!! HERE BOY’, to put you off that name, for life. Another thing that naive, pre-pregnancy me thought I’d be impervious to is other people’s reactions. ‘I wouldn’t care much about Liz-from-work’s opinion on my dress sense, career path or taste in music,’ I’d think. ‘So why would I mind if she doesn’t like my favourite names?’. You will. Because, the slightest evidence of distaste – the look in her eyes, the register in her voice, the length of pause before she says ‘Ohhh that’s nice’, will bring to the fore any latent doubts you had about the name yourself. It’s too informal, it’s too androgynous, it’s too ‘hard-sounding’ – Liz-from-work’s eyebrow movements will say it all. Being middle-name-less, I never really saw the point of them. They just lurked in between your first and family name, not as important as either and not serving any purpose other than to be a mild source of embarrassment. But when I became pregnant, all of a sudden a middle name became poignant – it was for ‘posterity’. Your child’s middle name can be the tribute to your mum, dad, grandparent or brother. A non-invasive tattoo, if you will. But…which mum, dad, grandparent, brother? How can you choose just one without peeing off the others? And what if you really want to use your beloved granddad’s name, for instance, but he was called….Norman. Or Clive? Suddenly, my lack of middle name made sense again. Like many women of my generation, I don’t want to change my surname when I get married. I like to do my bit to smash the patriarchy, but, mainly it’s because I don’t want to change my lovely, neat, Irishy surname to my boyfriend’s hard-to-spell German one. So when it came to deciding what our child’s surname would be, we opted for double-barrelled. Something that I was wholly comfortable with pre-pregnancy, but now can’t completely rid myself of the fear that it’s, in the words of our health visitor, ‘very long’, or, as I’m positive my boyfriend still thinks, ‘a bit poncy’. Of course, there is the trend of using one parent’s surname as a middle name instead. A nice idea, sure, but something that still needs proper consideration. There’s not many things I remember from my GCSE biology lessons. The day we found out that pretty, popular, perfect Lucy’s middle name was ‘Douglas’, however, was one of them.